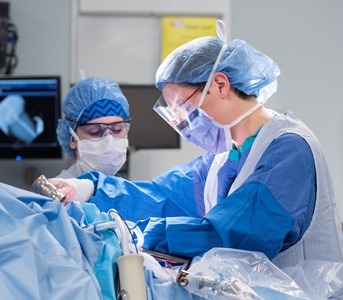 Researchers at The Ottawa Hospital and the University of Ottawa are tackling the often-overlooked issue of delayed emergency surgeries. Emergency surgeries are those needed quickly to treat serious injuries or life-threatening conditions, such as a hip fracture, appendicitis or a burst blood vessel. Emergency surgeries represent 13 percent of surgeries performed in Ontario, according to the Ontario Ministry of Health and Long-Term Care1. Canada’s aging population will likely increase demand in the future. Dr. Forster and his team published a study in CMAJ that shows there are consequences for both patients and the hospital when emergency surgeries are delayed. Because there are no standards for the timeframe a patient with emergency needs should get into surgery, the researchers set an aggressive scale for the different grades of urgency. They found that patients whose emergency surgeries were delayed had a 4.9 percent mortality risk in hospital, compared to a 3.2 percent risk for non-delayed patients. Delayed patients also stayed in hospital after their surgery on average 1.1 days longer, and cost the hospital $1,409 more than patients who were not delayed. The researchers looked at data from 15,160 adults who had emergency surgery at The Ottawa Hospital between January 2012 and October 2014. They found that 2,820 of these patients, or 19 percent, experienced a delay. The reasons for delays were known in 39 percent of cases. The most common reason was that no operating room or operating staff were available. The researchers spent the first three months of the study collecting data on the demand for emergency surgery at The Ottawa Hospital. In January 2013, the hospital began using a new method for scheduling emergency surgeries. This included dedicating operating room time specifically for emergency surgeries and spreading elective surgeries more evenly throughout the week. After the hospital implemented this new model, there was a significant increase in the number of emergency surgeries that happened on time. This study’s findings justify these changes made by The Ottawa Hospital, and justify other health-care institutions focusing on the issue. The study also showed that the risk of dying after surgery tapered off for patients who waited over 1.1 times their assigned wait time. This surprising finding could mean that some patients need surgery immediately, but others can tolerate the wait. “If we can find out why these patients can tolerate waiting a bit longer, then we can identify which kinds of patients and surgeries should be prioritized,” said Dr. Daniel McIsaac, first author and an associate scientist and anesthesiologist at The Ottawa Hospital and assistant professor at the University of Ottawa. Dr. Forster’s study was possible because of generous support from the community for Research to Improve Patient Care. It is an example of how research at The Ottawa Hospital is making Ontario Healthier, Wealthier and Smarter. 2 The Office of the Auditor General of Ontario. 2016 Annual Report. Chapter 3.08. p. 447-448.